Stunning lakeside suites in the heart of downtown Grand Marais on Lake Superior. From romantic 2 person studios to very spacious, luxury 3 bedroom suites that sleep up to 8, every suite is beautifully designed for a worry-free vacation experience. Most suites include a balcony or patio, kitchen, fireplace, LCD TV with DVD, VCR and satellite, and complimentary wireless internet. Minnesota's first premiere luxury hotel, the Minneapolis Grand offers guests beautifully appointed guest rooms and suites which feature residential finishes and state of the art technology. Meeting and Event space provides guests a unique venue for both social and business occacions. 50,000 square foot Lifetime Athletic Club in hotel features full fitness cardio-vascular workout systems,swimming pool, free weights, aerobics, squash courts, racquetball courts, steam rooms,running track,boxing ring, spa,massage,wellness programs,health and beauty treatments,life style counseling and curriculum. Access to athletic club included in guest room rate. Full service spa in hotel. Sophisticated modern luxury: Graves 601 stands among the business, theatre and entertainment districts, in the middle of downtown Minneapolis, directly across from the Target Center. The rooms offer 42 Zoll plasma TVs, three telephones, T1 connections, five-head showers, and glass etched headboards. Located in the City/Business district. 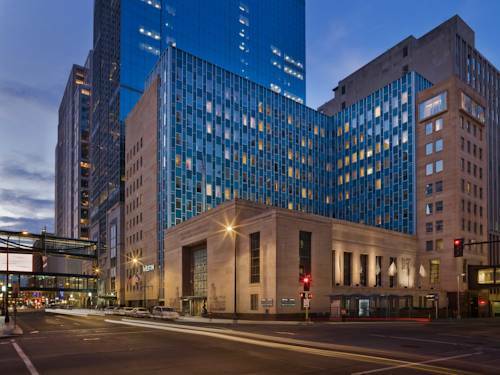 Transformed from Minneapoliss historic Farmers & Mechanics Bank building, the Westin Minneapolis will be your home to renewal in the Twin Cities. This landmark hotel features the original 34-foot vaulted bank lobby, marble staircase, and wood-carved emblems signifying the leading industries of the World War II era. At the pulse of cosmopolitan Minneapolis, our hotel is conveniently connected to over 7 miles of the Minneapolis skyway system the city's signature walkway to business, shopping & entertainment venues. A seamless integration of contemporary convenience and historic significance, our 214 guest rooms boast an intriguing combination of sophistication and rejuvenation. Renew at The Westin Minneapolis and experience the heart of refreshing sophistication in a historic revival.